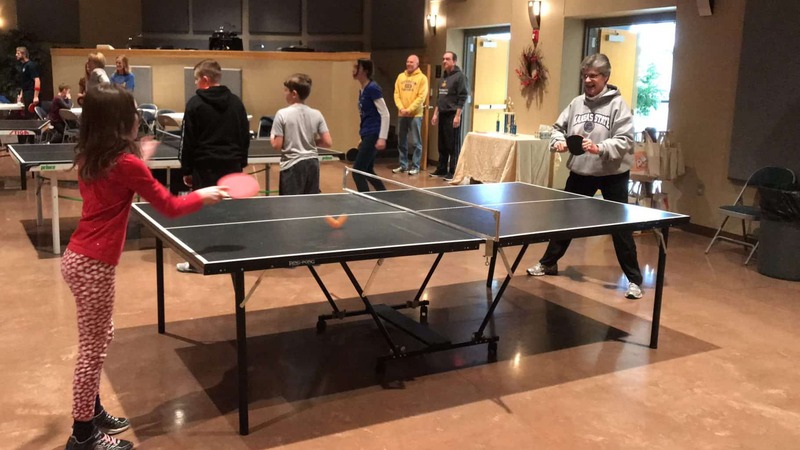 I did not win the 2nd Annual Winter Slam Ping-Pong tournament at Grace United Methodist Church on Sunday afternoon. It’s the 2nd year in a row that I did not win or place in the top three. It is the 2nd year in a row that I blamed the referees (which I now understand are actually called “table bosses”… whatever), my parents for not making me practice more in our basement when I was little, and of course, my paddle. This year I was twirling it quite adeptly as I walked down the hall toward the tournament (I’ve seen other players do it and it makes you look cool) and there was a slight earthquake and I missed the handle on one of the twirls and it fell to the floor and cracked. Yes, I did have to duct tape it to hold it together. Luckily the Grand-Master Winter Slam Czar (you know who you are, Brad Hrabik) who puts the tournament together and thinks of everything, had duct tape. It happens to be the color of the Baylor Bears’ translucent green uniforms they sometimes wear during basketball season, but it did hold the handle together. The relative investment I made in this paddle may be a sign of my level of talent. My first round of play was with a very nice young 3rd grader who just that morning in worship, when asked how old I was, guessed 70 *snort*. When I asked how old she was in return she told me, and I quote, “8 and 11/12ths”. How do you NOT love that child?! Those are the best answers EVER! 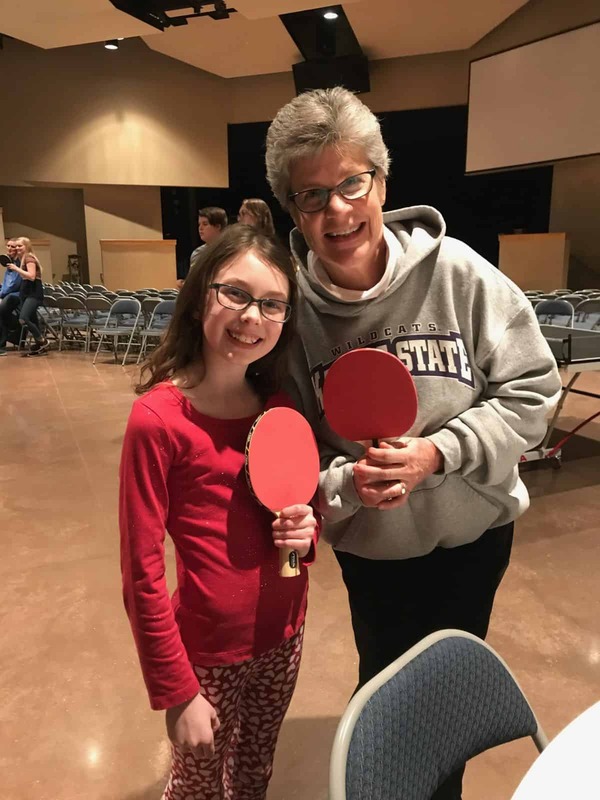 And out of all the 3rd graders to whom we gave Bibles that morning, SHE was at the ping-pong slam tournament with her parents and siblings and we got to play ping-pong! The wonderful thing about being friends when you’re 70 and 8 and 11/12ths is that your ping-pong talent is relatively the same! We had major fun, had a little trouble remembering our scores, and the handshake and hug after the match were quite collegial and good sportish. Natalie, we probably will be used as the poster children for the marketing campaign for the tournament next year. The first place winner will one day be a medical doctor. My disappointment for him is that after winning this tournament, everything else in his life will likely be anti-climactic. I told him I expected to see the championship trophy in his clinic when I come see him with the flu in the years to come and he said that absolutely, his medical degree will be somewhere in the closet but the trophy will be right out front! His dad took 3rd, which clearly means there’s some kind of ping-pong gene running rampant in that family. Come to think of it, last year’s 2nd and 3rd place winners were son and dad, AND last year’s winner NOW has a son who is almost a year old and was close to bursting into the world when his dad took first last year. Something feels a leeeeetle nepotistic in all that, just sayin’. My green duct-taped paddle and I may have to do a little digging and research before next year’s set of matches. If it looks serious, make no mistake, I’ll not hesitate to get the NCAA violations committee involved – they might have a ruling by 2025. Whaaaaaaat?!? That was not a pastoral comment at all! You know what? There was a lot of other stuff that happened in the world last week. There was a suicide bombing in Kabul, Afghanistan made only worse by it being hidden in an ambulance that drove into a populated area; 203 killed, that many and more injured. There were two school shootings last week, one in Italy, Texas and one in Marshall County, Kentucky. One student injured in Texas, two students killed and 18 injured in Kentucky. That makes 11 school shootings in our country since the first day of this year. And in our own area, we mourn with our Shawnee Mission Northwest High School neighbors on the death of two students by suicide last week. So what in the world am I doing spending time at and talking about a Winter Slam family day of playing ping-pong at Grace?! Shouldn’t my mind be focused on the problems at hand? Finding some new way of intervening in this destructive violence that we can’t seem to get in front of or stop? Doubling down on prayers and scripture and fasting and bible study? Spending longer hours on research for these sermons that don’t seem to be changing anything in a world that is too fast losing its way in self-destruction? Isn’t that what a pastor SHOULD be doing? Isn’t that what you have a right to expect your pastor TO be doing? What must God be thinking? and hugging 3rd graders and 70 year olds, and then everybody (winners and losers) hanging around to put the chairs back in order, re-set the regular tables, and help load the ping-pong tables back into trucks for hauling back to generous homes – what if NOT doing all of that is PART. OF. THE. PROBLEM?!!!!? It’s really not simply either-or, is it? It’s finally a both-and proposition. My faith in God over lo these many years of mistakes and impatience and sometimes stubborn “stiff necked-ness” has brought me to an understanding and a strongly held belief that there is a sacred rhythm to life. I don’t always understand it. I don’t always accept it easily. I don’t always live into the rhythm that the universe is all too clearly telling me is best. I sometimes rant and rage about it. The older I get and the more good people I have to say good-bye to, the more I sorrow and grieve about it. But I very rarely any more doubt it. 70 years (maybe 70 years worth of life lived in a few years shorter than that *wink*) has taught me that sometimes ping-pong with friends and deep prayer in the midst of tragedy are as necessary to each other as life and breath, and spirit and body, and grace and forgiveness, and compassionate accountability and mercy. So I didn’t win the 2nd Annual Winter Slam Ping-Pong Jam tournament again this year, well, not on the final bracket or any of the trophies. But I did win a Sabbath time spent for a few moments watching and experiencing mutual support amidst tough competitors, the welcome of every age and skill level, and simply flat out fun hanging with folks from Grace. Did we change the world? I think a little. Will bad things still happen? Probably. Will we have that much more strength to face them? Without a doubt. ‘Cause someday when you go into your Dr.’s office and instead of a Medical Degree hanging proudly on his wall, there’s a Ping-Pong trophy hanging out in the corner, you’ll know you’re going to be alright. And maybe for a moment, or a minute of grace, that’s enough.